A vintage littlun gets dragged in to the 21st century! I've been rather taken with the lines of the old Keil Kraft Pixie. 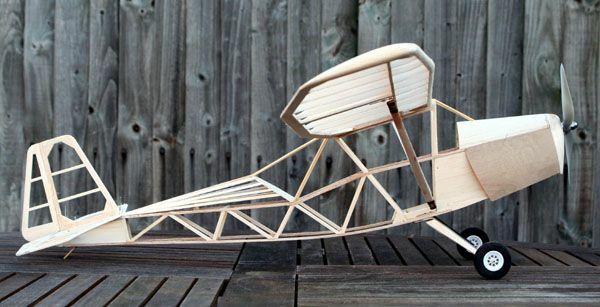 This little rubber-powered freeflighter boasted a huge 23" span, and looked like it should belong to the Auster family. 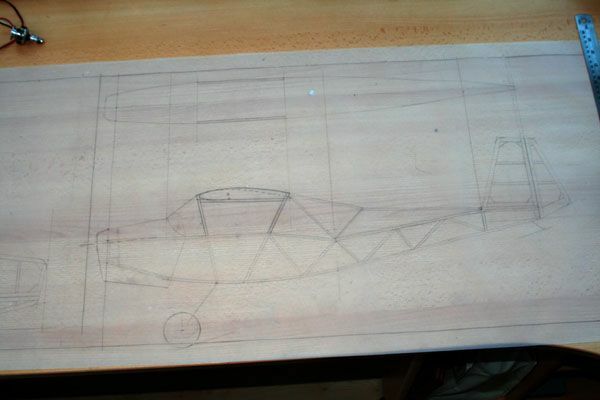 Anyway I thought it might be nice to re-draw the design at around 42" span, add a sprinkling of electric power, and a couple of advisory control surfaces for some calm-weather pootling. 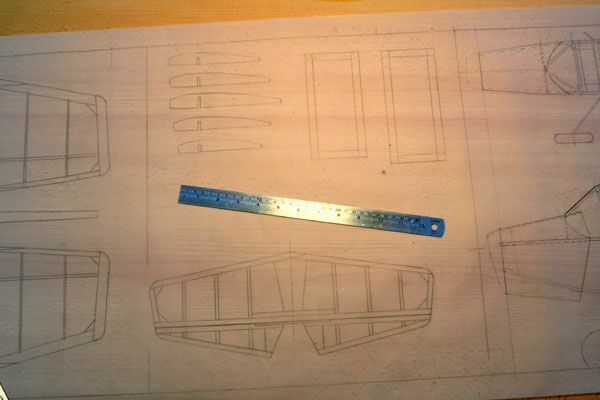 We're aiming for a pretty minimalist structure here - the fuselage will be made from 1/8 square stickery, whilst the wings are plug-in affairs. All the flight loads (such as they are) will be taken by the underwing struts. I've jacked the tip up by 1Permagrit block to allow the fitment of the root rib. At this scale this is so much better than messing about with one of those silly little gauge things. 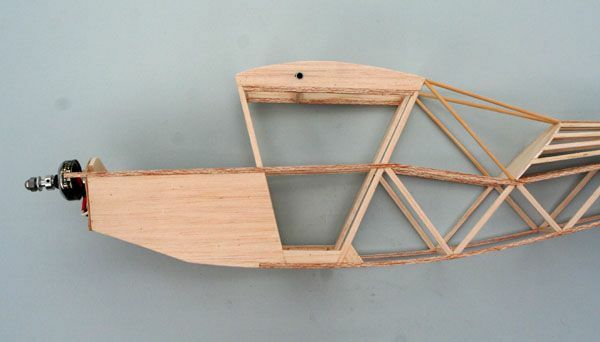 The tail surfaces couldn't be any simpler - just 1/8 strip. 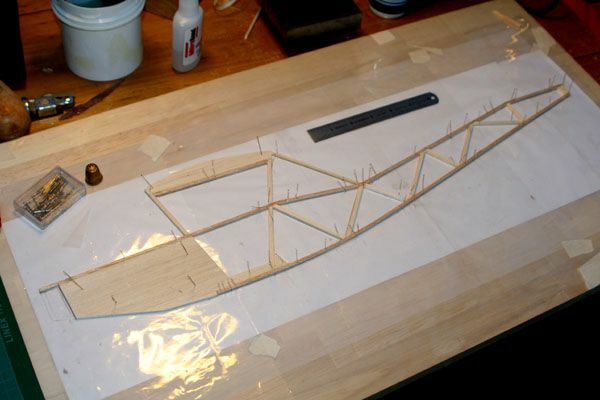 Here's the first fuselage side being framed up. I'm aiming for an AUW of 17oz or so. 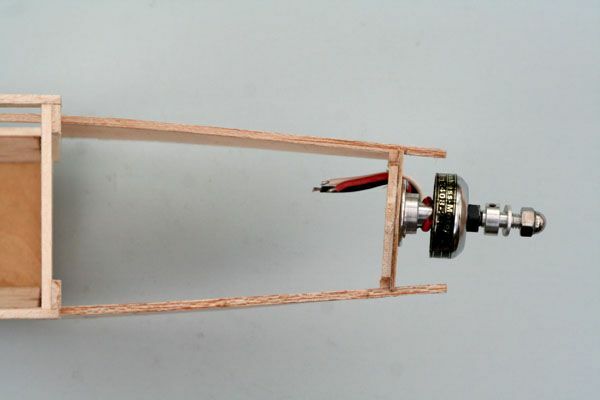 Power will come from a budget set-up;- bell motor, 15A ESC and 2S 1300 li-po pack, 9x6 prop. Looks sweet Tim. I bet it flies really slowly. I'll let you know Bruce - but I don't thinking we'll be breaking any speed records with this one! A little more progress this morning. F1 and F2 are universal to any aeromodeller! 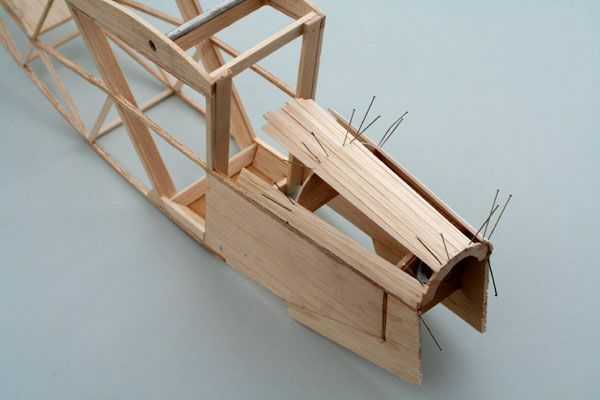 "A collection of holes - lightly trimmed in balsa"
Nice job Tim. Look forward to seeing this one finished. 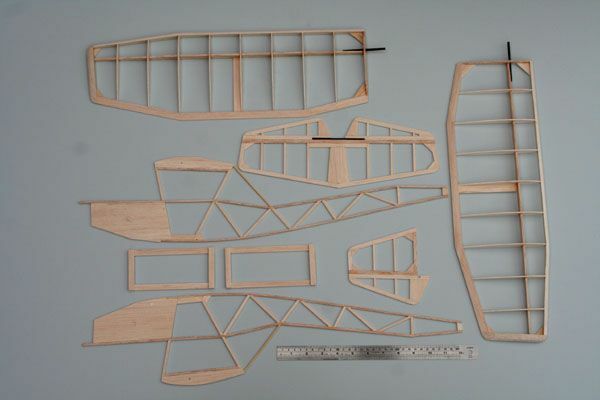 Like the parts layout photo! Have you decided on a covering material and scheme?? For a colour scheme I'm envisaging a mixture of white Litespan, combined with silver and dark green Solite to give a civilian look. I did contemplate camoflage briefly (think RAF Auster or Bird Dog), but it seemd too dour for such a pert little model! The better half has already comped up a suitable logo for the wing anyway! I've just spent a happy couple of hours faffing about with the stringered rear deck. 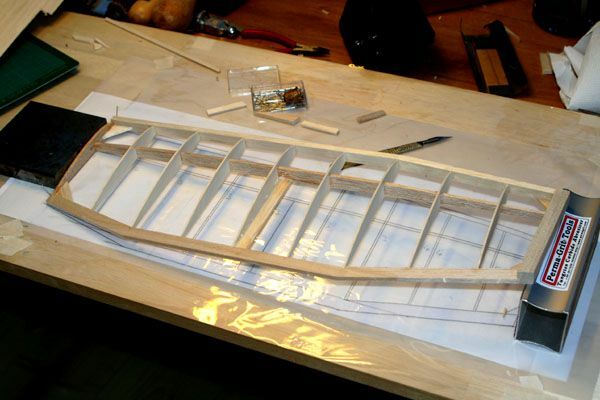 I started out with the central stringer, and the sloping aft former, then added the smaller mid former, then crammed all the rest of the stringers into the little bit of space that was left! 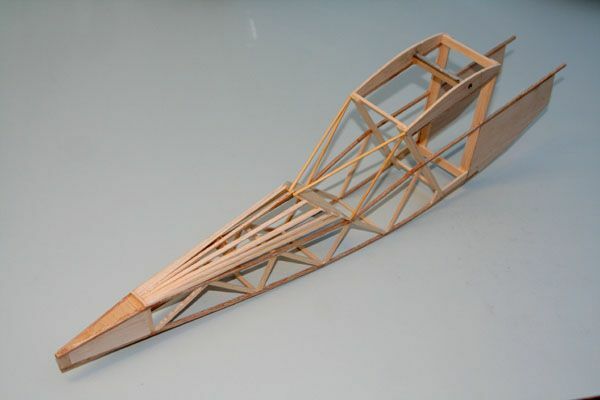 F1 is laminated from 1/16 ply and 1/8 balsa sheet, and is added to the nose at the required down and sidethrust angles. The mighty bell motor has found it's home! 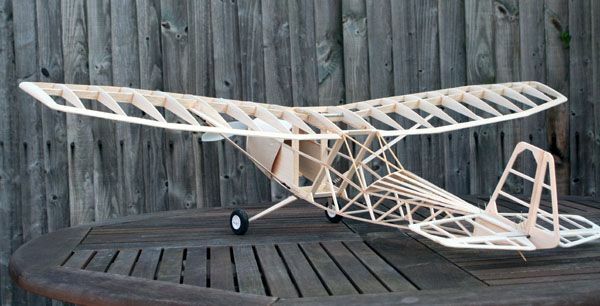 I love these lightweight structures, and how amazingly light they can be! speaking of which, I have that main board from my vapor knocking around somewhere! Nicely done! 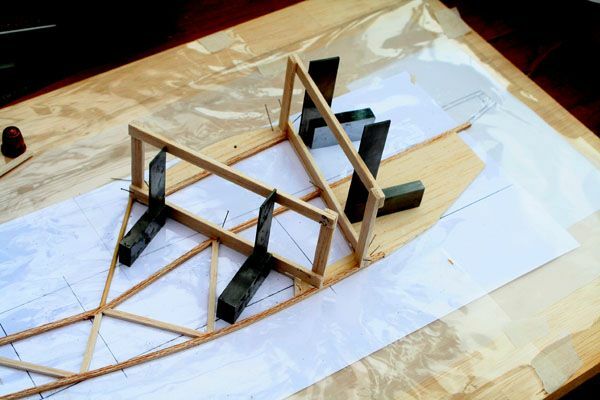 I am only in admirations to the experts like you who can draw plans! Let alone make them as well as you! I look forward to seeing some piccies of her in the air! Looks like another good one Tim, if it looks right it is right! Pity about that Wakefield bipe, it really looked the biz but as I understand didn't fly so well. Hi Tim, You have beaten me to it , I was going to build the same model . As I already have the enlarged plan . But I still have other projects on the go . Still I guess I will see how well it flys now I hope . It's always good to read the comments of other modellers - it's a real boost. 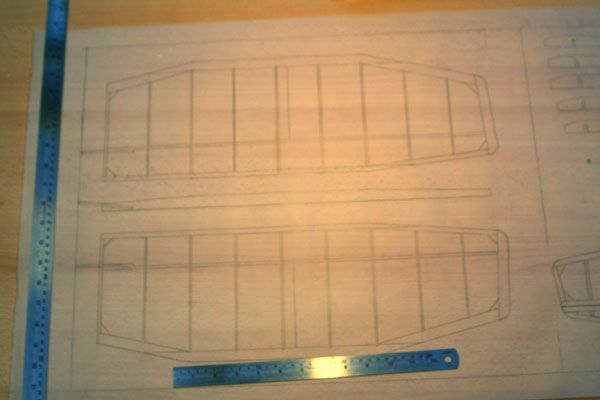 I've had a bit of a re-think about the front fuselage sides, and have added to their depth so as to match the outlines of the final cowl shape. The problem is that I need to have the bottom of the cowl removable as a battery hatch, and this the easiest way of achieving that. 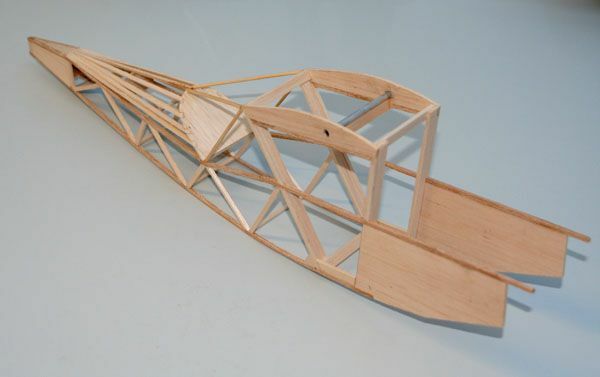 I also planked the top of the nose with 1/16 balsa strips. I'll trim them to length later. Hi steve , This has already been done as a free plan back in 1989 check out my hobby stores its on sale for ?5.97 this is the plan I got as a free plan it was done over two issues . 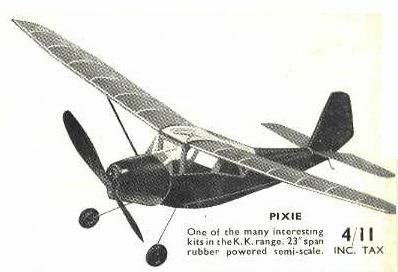 Pixie 2.5 is 2.5 times larger than the original and power by a 2.5 diesel it was also done with the kind permission of Keil Kraft . Although it did not fly straight of the board it had to go through some modifications before it became a fine flyer for those lazy summer afternoons. 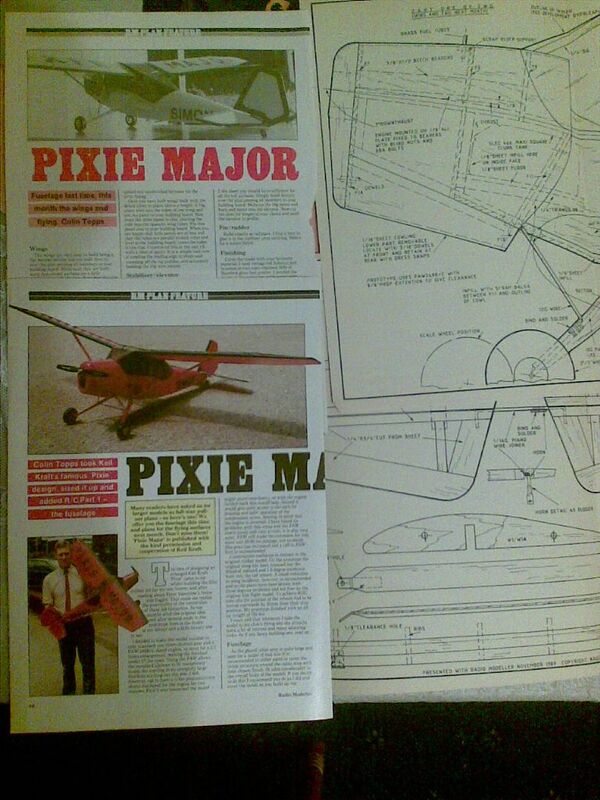 Just in case any one would like too look at the Pixie Major here is a picture . Its a bit on the large size for some at 58"
I had no idea she'd been enlarged before, but it really shouldn't be a surprise given her good looks, now should it? I can't make out the text, but I'm guessing there's a .25 - .40 lurking in there somewhere. Any ailerons? Despite its size a diesel 2.5 or OS 15 fp is all that was needed and that was over Kill as only need 1/4 power to fly and the 4oz tank lasted for more than 1/2 an hour as it was quite happy gliding around . 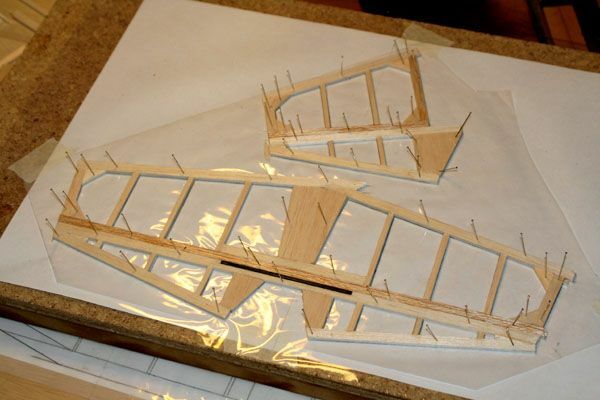 And as for the radio no need for ailerons rudder elevator and throttle was perfect according to the builder . This is one i also built as a child and so when the plan came out i just had to have it . Funny thing is to this day i have never got round to building it , maybe some day soon . 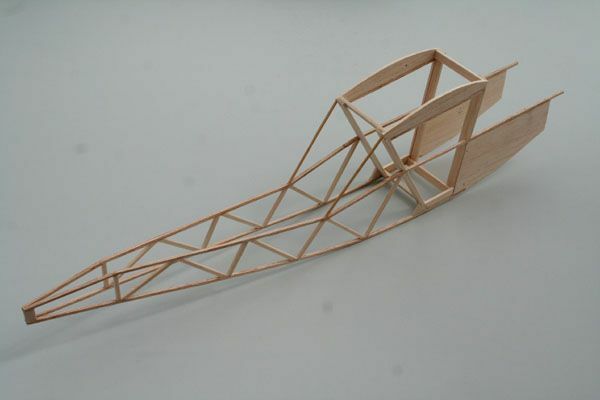 Posted by Stephen Jones on 12/06/2010 14:55:54:Funny thing is to this day i have never got round to building it , maybe some day soon . Go for it, Stephen - it's just to pretty not to be built! I've reached my favourite stage of any build; the bit where I get to pin/tape it all together and get to see what it'll look like as a finished model. I'm not displeased! 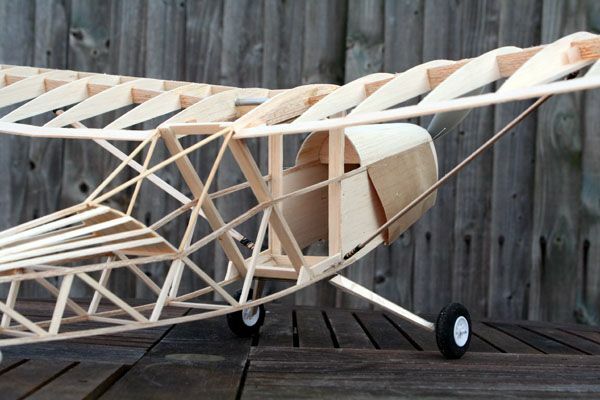 The weight of this 42" model (including motor and prop) is currently less than 7oz. What is very apparent though, is that it's quite nose-heavy as it stands, so my original plan of having the 2S cell-pack in the nose needs a serious rethink. I'll probably end up putting the micro servos in the tail, and the battery behind the undercart. No matter, it's all very do-able! 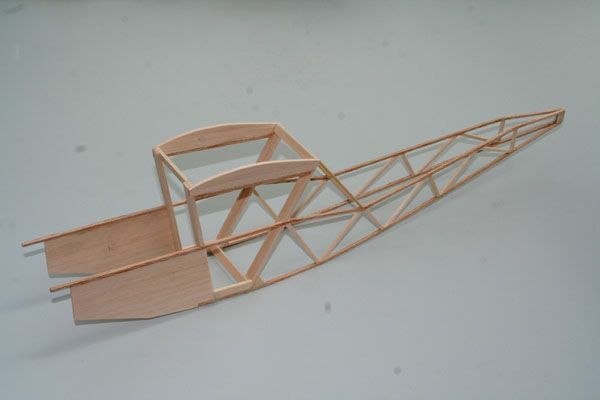 Looks very nice , i see you have not built the tailplane to scale and the elevator is much reduced is size . 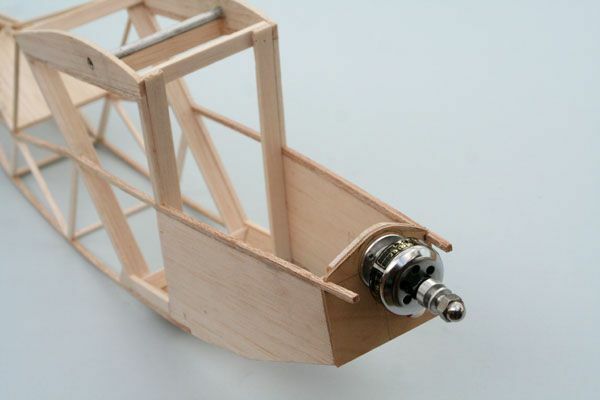 This is one of the modification that had to be made in order for it to fly correctly . And with that low weight yours should also fly well . 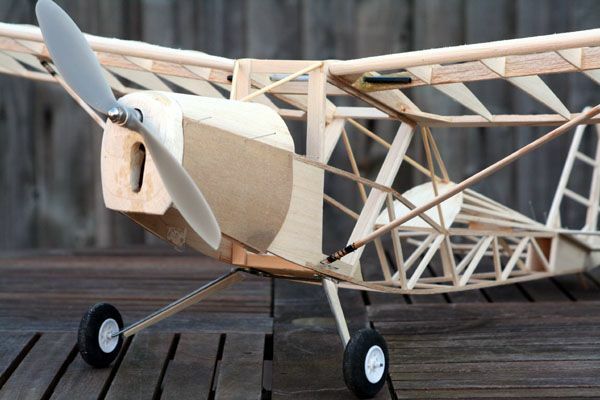 I look forward to seeing the finished model along with a video of it flying .